A memorial at the site where Jacob Klepacz was found beaten and unresponsive has been adorned with fresh flowers since April 28. 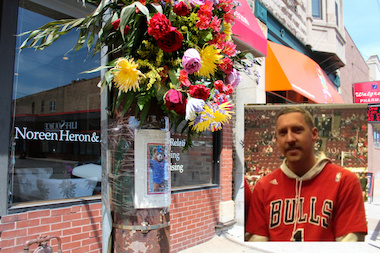 LINCOLN PARK — Jacob Klepacz, who was found unresponsive on Fullerton Avenue in April, was a homicide victim, dying from blunt head trauma from an assault, officials have ruled. Friends and parents of the 32-year-old have voiced frustration over a lack of information from the Chicago Police Department in the months since his death. The murder was the first in Lincoln Park since September 2011. Chester Klepacz, Jacob's father, said he was told by police that he would be contacted when the autopsy was complete, but he learned of the development Thursday from a DNAinfo Chicago reporter. "The police told me I would be the first to know," he said. "We haven't heard anything. If I don't call them, they don't call me." Chester Klepacz said he has been trying to get a copy of the police report in the case, but has consistently been denied and was told at one point to file a Freedom of Information Act request. Klepacz, a West Town resident, said he has considered putting out a reward or hiring a private investigator in the case, but police warned against those options. A Chicago Police Department spokesman said the case remains an open and active investigation. "The case is open and being investigated, and that's as far as we are going to go with it," said Chicago Police Lt. David Harris. "We don't want to jeopardize anything that's going on." Klepacz's death sparked a campaign by his friends to find out how he died, an effort that included handing out fliers and launching social media accounts to raise awareness about his death. The Cook County Medical Examiner's Office ruled the death a homicide this week. Klepacz, 32, was intoxicated when he died, a morgue spokesperson said Thursday. Klepacz was found beaten with severe head trauma in the early hours of April 28 in front of 1530 W. Fullerton Ave., according to police. He was unresponsive when emergency crews arrived and was pronounced dead at Advocate Illinois Masonic Medical Center shortly thereafter, police said. Friends of Klepacz said they saw the homicide classification as good news that will move the case forward. "At this point, we just wanted that homicide [classification] so that now people can be charged," said Angela Caravetta, a Klepacz friend. "We may never know the truth about why, but we want somebody to pay for what they did." Caravetta and Klepacz's friends have been keeping up with the case daily, making sure fliers with information about the case are posted in the neighborhood and using social media. Family and friends held a Mass for Klepacz on June 29 — a day that would have been his 33rd birthday. They also participated in a PAWS Chicago 8K run since Klepacz liked to volunteer at the animal shelter. Before the morning of the attack, Klepacz had been out drinking with friends and watching the Blackhawks game in Streeterville. His last post on Facebook indicated he was at The Dugout Sports Bar & Grill in Wrigleyville later that night. An email from 32nd Ward Ald. Scott Waguespack's office indicated that police said it was not a random attack and that Klepacz had met up with "the possible offenders" before coming to the Fullerton location where he was found.